Jill Stuart cosmetics has been nothing short of a stunning success since its debut in Japan in 2005. From its very first day, its gorgeous princessy packaging and cute GWPs have been highly sought after by Japanese ladies and its limited edition collections often sell out on the day of release. In particular, its Christmas 2006 coffret set saw long queues forming on the morning of release, even before the stores opened and all were snapped up by the end of the day. Many of its limited edition sets or GWPs such as the glass boxes or pouches are often resold on Yahoo Japan auctions for fairly high prices. The products are all made in Japan by Kose, which has done a surprisingly excellent job of marketing the Jill Stuart line unlike for its own other flagship brands which rarely stir up the consumer frenzy that Jill Stuart does. Jill Stuart has been opening counters quitely rapidly throughout Japan. Currently, there are 10 counters in Tokyo alone. In general, the quality of Jill Stuart makeup is above average. Personally, I like their loose face powders (4725yen), Lip Lustre lipglosses (2940yen), Eye Jellies (2310yen) and Brilliance Eyes palettes (5250yen) the best. I have the Loose Powder #1 Natural (see pic below). It comes in a very generously sized pot (net weight: 20g) with a wonderfully plush cotton puff (love the pink ribbon detail!). 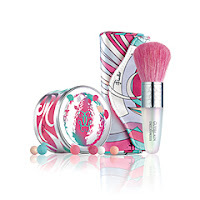 The powder itself is very silky and finely milled and gives an excellent natural finish. Just looking at the elegant pot sitting on my dressing table is half the fun of owning this! Another of my very first purchases from Jill Stuart was the Blush Powder in #8 Aurora Rose which is a slightly shimmery medium rosy pink with great colour payoff. But if not for the elegant pot, I don't think the blushes themselves are that extraodinary. You can buy the blush powder as refills for 3150yen but even at that price, it's still expensive. The short fat brush included is decent, not the softest that I've come across but it does the job. Currently, there are only 9 shades available. 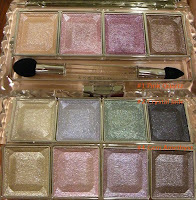 But if you have to get only one item from Jill Stuart, my vote would go to their Brilliance Eyes palettes. These are not cheap but they're worth every single cent. All of them are just so gorgeous that it's hard to even pick a favourite one out of the four currently available. Several friends that I've recommended these to have ended up collecting all four and no one has regretted their purchases thus far! You know how very often when you buy a palette, there's always one or two colours that are totally useless either because it's strange when combined with the rest (MAC palettes come to mind...) or it's just not the kind of colour that you would normally wear. But all 4 Brilliance Eyes palettes have excellent colour combinations that not only complement one another very well but are also very flattering and easy to wear. 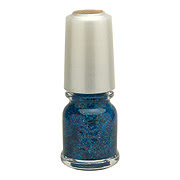 These are all shimmery with great colour payoff when applied either with a brush or the included sponge-tip applicator. 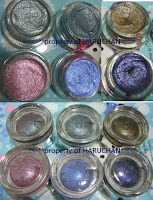 Of course if you don't like shimmery eyeshadows then these are not for you. But for those of us who love all things sparkly, these are a dream come true! These have been selling so well since they were introduced in January 2007 that they were often out of stock and customers had to place reservations just to buy these even though they are not limited edition. I was just at the JS counter earlier this evening and 3 of the 4 palettes were sold out (again!) which is just unbelievable. Net weight of product in each palette is 4.5g. And finally, on the Eye Jellies. 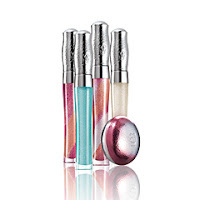 These have a true water-based jelly texture and most are shimmery. 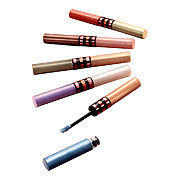 They are easy to apply, can be layered for greater intensity and dry down quite nicely. 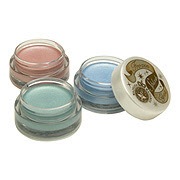 You can use them alone, or as an eyeshadow base or on top of powder eyeshadow for an added glimmer. My favourites from the regular range are #1 Green Butterfly and #2 Gemstone Green which are complex green shades that are quite difficult to descirbe. #1 Green Butterfly is like the jelly version of MAC Club. Currently Jill Stuart is sold only in Japan but given how well it has been doing, I would not be surprised if Kose decides to expand it overseas in the future. Collection due out on 18 May in Japan. 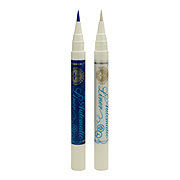 Water Eye Color Duo in 5 variations, 3675yen. Limited edition. 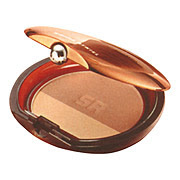 Poudre Bronzer, 5250yen. Can be used as blush, highlighter, bronzer and shading powder. Lip Gloss #6 (coral pink) and #7 Caramel Glace (caramel brown), 2625yen. Limited edition. It's that time of the year again for Ettusais' mini nailpolish collection. I think this is the 3rd time that they're doing it. These are great for people like me who have never managed to finish a bottle of nailpolish. 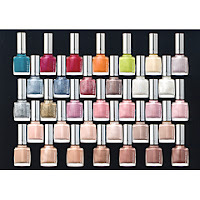 These are 210yen each for 2ml and this collection features 15 shades. Tuolene and fragrance-free. This one is for dear Fleckenschnitte! 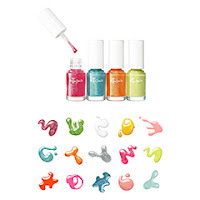 Susie NY is revamping their entire nail polish line. Hopefully, it will be just as good as the previous range which I love for their brilliant colours and long lasting nature. But the price has gone up to 840yen from 735yen, sigh... 33 shades in total, with camomile extracts and silk protein. Also debuting are the Remover Essence In (has camomile extract, olive oil, avocado oil, macadamia nut oil and silk protein, 735yen), Top Coat Gloss (840yen), Nail Hardener Protect (840yen) and Base Coat Long Keep (840yen). 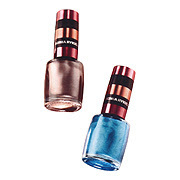 The Nail Hardener and Base Coat have the same camomile extract and various oils as the Remover Essence In. Due out 25 April in Japan. 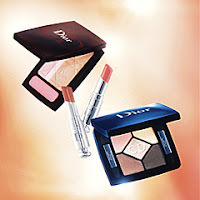 Dior's summer collection due out 27 April in Japan. 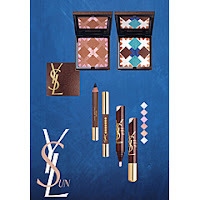 YSL's summer '07 collection which is due out on 27 April in Japan. I wonder why makeup companies seem to think that they can get away with charging 3780yen for 2.5ml of lipgloss when their own lip plumper sells for only 2835yen for 15ml!! The click-on nail polish sounds interesting though. Two palettes, one for face and one for eyes. 7665yen. 9g. Nail Touch in #1 Secret Radiance (transparent), #2 Pink Radiance (sheer pearly pink), #3 Violet Flush (pearly purple), #4 Beige Light (pink beige), #5 Golden Reflection (elegant pink) and #6 Sparkling White (pearly white). Comes in an innovative "one-touch, click-on" type packaging. 3360yen. 4ml. I'm not usually a fan of Guerlain but the colours and packaging of this collection done in collaboration with Emilio Pucci are just too gorgeous for words! Collection is due in Japan on 11 May. All items are limited edition and I'm sure this collection will sell out in a flash. Swirl Gloss #4 Pinky and #5 Apricot, 3360yen. Sparkling Gloss #2 Gold and #3 Riveria, 3360yen. Snapped these Kiss displays in Tomods drugstore today :-) The photo on the left is the Mat Chiffon products display while the middle photo is the permanent Kiss shelf display. The photo on the right shows their Christmas 2006 Twinkle Snow collection display. I love the special displays that Kiss does every month as they're always so feminine and pretty. Lunasol Summer'07 collection pics! Due out 11 May in Japan. Looks like Lunasol is continuing with the beige-themed Skin Modelling eyeshadow palettes for now. One interesting new product is the Jelly Eyes, which looks like a knock-off of Jill Stuart's Eye Jellies given the virtually identical name, glass pot packaging and even the exact same price. Paul & Joe's summer '07 collection theme is "Secret Beach"! The collection comes in 2 parts. The bulk of the collection will be released on 1 May for Japan and the pressed powders will be released on 1 June. Strangely, there are no eyeshadows or lipsticks in this collection. That may be due to the fact that they just revamped their lipstick range. Still, I wish that they would put out their Collection Sparkles collections more frequently instead of just in spring and autumn as the Collection Sparkles items are the most memorable for me. The Collection Sparkles archive page on the P&J official website is so droolworthy. 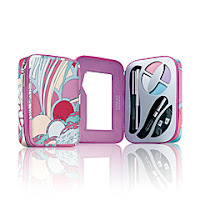 Beauty Mirror (2940yen): this is so pretty! Paul and Joe cosmetics is made in Japan by Albion Cosmetics. 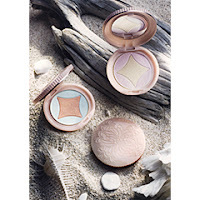 Majolica Majorca's Summer'07 Mermaid collection will be released on 21 April in Japan. To be honest, this collection doesn't excite me much as I usually prefer powder eyeshadows to cream eyeshadows. Also, the packaging of Frozen Splash Eyes is nothing special and kind of a disappointment following MJ Spice. The color variations also look like the typical pastel shades that are a dime a dozen in Japanese brands. Hopefully, the quality and texture will be similar to Pied Nus Sparkling Eyes, Shiseido The Makeup Hydropowder Eyes or the cream eyeshadows in Ipsa's 10th anniversary kit since these are all made by Shiseido. The blue eyeliner looks promising but I hardly ever use eyeliner. The blue mascara is almost certainly a no-go for me. Come on, MM! Give us something really unique and lemming-worthy like Aromajica or Compact Fantasia! The Jill Stuart website has just been updated with the new promo image for the Extra Curl Mascara Waterproof (3150yen) debuting 27 April in Japan. 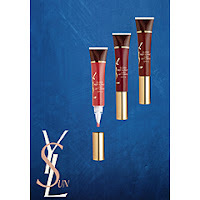 It is supposed to be a soft, creamy consistency that helps to maintain the curl of your lashes while keeping them soft. The fine-toothed comb helps to separate lashes for a well-defined look and the coil at the base of the comb helps to coat the lashes thoroughly from the root to the tip. It contains "pure crystal powder" and a "crystal floral bouquet" fragrance (whatever that means!). It will be available in only one shade for now, #1 Pure Black. Majolica Majorca is a very popular drugstore brand made by Shiseido. Priced between 315yen to 1890yen for its foundation refills, its main competitor in Japan is Kate which is made by Kanebo. For now, Kate is still the top drugstore makeup brand but MM has its share of devoted followers, thanks to its lovely packaging and unique limited edition releases every season that quickly become sought-after collectibles. The line is targetted at young women in their teens and 20s, hence the preponderance of shimmery, bright shades. MM releases 4 collections every year (spring in January, summer in April, fall in July and holiday in November). Its holiday releases are usually extra special such as the Little White Book & Little Black Book(2003), Compact Fantasia and mirror (2004), Lady Cat (2005) palettes and Love Hunter (2006) palettes. The star products of the line are: Majolook eyeshadow palettes (1470yen-1575yen), Shadow Customise (single eyeshadows, 525yen), Lash Expander and Lash Enamel Glamour mascaras (1260yen) and Neo Automatic Liners (1260yen). Lash Expander was so popular at one point that it was sold out for a couple of months in 2006 before Shiseido could re-stock it. Lash Expander claims to lengthen lashes up to 15 times (obviously an exaggerated claim since your lashes would be brushing your hairline if that was true!) while Lash Enamel Glamour is a volumising mascara. 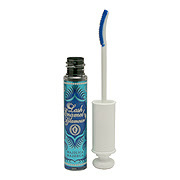 Lash Expander is a fibre-based mascara while Lash Enamel Glamour is not. I've actually never tried either Lash Expander or Lash Enamel Glamour although I've CP'd dozens of them for friends as I'm not a big fan of comb-type or waterproof mascaras given my fragile skimpy lashes. My favourite products from MM are the single eyeshadows in GR664, SV821, BL724, BR710 and the MJ Spice in RD Sensual Spice. The Compact Fantasia is my most treasured MM item, love how the egg-shaped compact nestles perfectly in my palm. I also adore the brightly coloured Majewel compacts from Spring 2005. However, I must say MM's recent collections have not been as attractive as before such as their Majolook Frame Impact series which frankly had very strange colour combinatons. The only hit from the Spring '07 Like a Doll collection was the MJ Spice range, which was just too cute! The upcoming blue-themed summer '07 Mermaid collection looks like it may be very difficult to pull off for ladies who are no longer in their teens. MM has a fantastic official website that is updated with a Flash presentation with each new collection. You can also view the presentations for previous collections on the website. Each collection is showcased as a "Chapter" in the MM Theatre. Do check it out! Kiss is one of those excellent drugstore brands that the Japanese are so good at producing. The price range is from 525yen to 1680yen. Kiss usually releases one collection a month. The star products are: Mascara Glamourous Volume WP (1470yen), Dual Fairy Blush (1260yen), Eye Nuance Palette (1470yen), Rouge Melty Syrup (1470yen) and Lip Apricot Jelly (840yen). Personally, I love their loose face powders the most, two of which I review below. The brand is targeted mainly at young women in their teens to 20s, with its princessy, largely pink packaging. I first got into Kiss when I came across a "lucky bag" promotion in December 2006 where sets with 10 Kiss items that had a total retail value of 8400yen were being sold for the bargain price of 1890yen. Many of the items in the photo above were from various lucky bag sets, limited edition and hence no longer available. 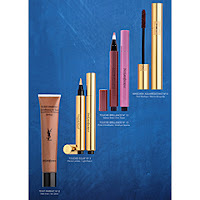 Mascara Glamorous Volume WP was voted the top mascara in 2006 at Cosme.net which is the largest Japanese makeup review website. I find the Rouge Melty Syrup to be quite moisturising with a distinctive berry scent but the shade selection is very limited. The eyeshadow palettes do not have the most glamorous packaging but the quality of the eyeshadows, which are all shimmery, is just as good as many department store brands. The colour payoff is excellent when applied with the included sponge applicator and using the cream shade (there's one in every palette) as a base. Moist Angel Powder R (1680yen, 6g, right in the pic) was released by Kiss in September 2006 while Mat Chiffon Powder (1680yen, 9g, left in the pic) was just released earlier this month. I've tried both and they're both excellent with a very finely milled, silky texture that goes on like a dream. The puff included is also very soft and feels great against my skin. Moist Angel Powder #1 Translucent is a very light beige while Mat Chiffon #1 Lucent Rose is a very pale pink-toned white. Both apply mostly translucent but Mat Chiffon #1 Lucent Rose give a slightly more dreamy finish. Moist Angel Powder currently has an average 4.6 star rating on Cosme.net while Mat Chiffon has an average 6 star rating (but that is out of only 2 reviews). Here's another pic of Mat Chiffon with the included powder puff. For my inaugural post, I would like to showcase my latest makeup purchase, this elegant limited edition Chiffon Case P from Albion Exage White. The interior has enough space to fit a sponge but the case does not come with anything to separate the sponge from touching the top of the foundation. I've filled it with a Revue foundation pan, which as you can see does not fit perfectly. 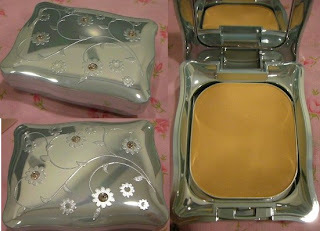 By the way, the case is too small to fit Shiseido brand foundation pans. Exage foundation refills retail for 4200yen each and are often voted the best powder foundations in various Japanese beauty magazine surveys and rank among the top-selling powder foundations at Japanese department stores. There are two foundations in the series, Exage Moisture Chiffon AI SPF15 PA++ and Exage White Summer Chiffon CR SPF20 PA++. Both come in 6 shades with a net weight of 11g. Moisture Chiffon contains mineral oil and olive oil while talc is listed as Summer Chiffon's first ingredient. I have tried samples of the Exage foundations before but did not find them to be extraordinary.